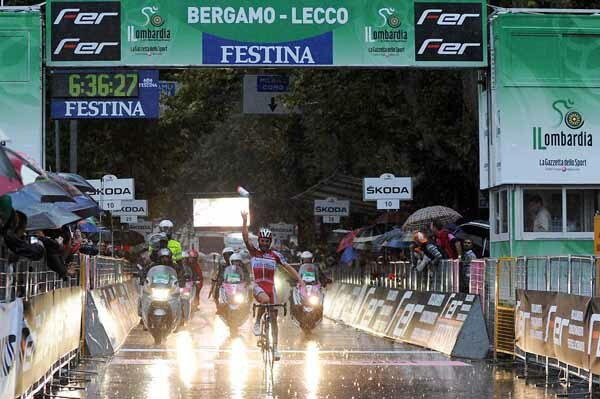 Team Katusha's Joaquin Rodriguez, second in the GC of Giro d'Italia 2012, won the 106th edition of Il Lombardia. 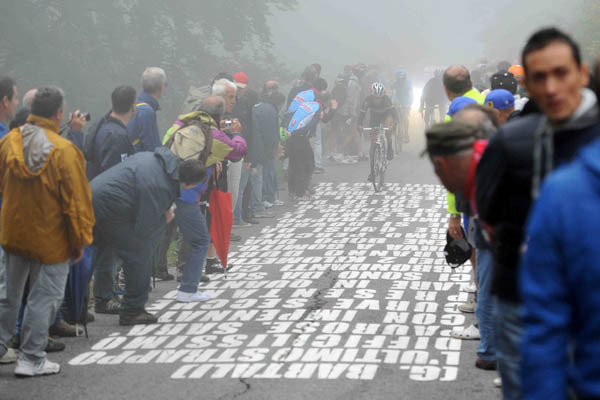 On a typical autumn day under hammering rain the Spaniard, after pushing hard on the climb of Muro di Sormano, succeeded in leaving all the contenders behind on the final climb of Villa Vergano to cross the finish line on Lungo Lario in Lecco, with his hands in the air, a clear winner. 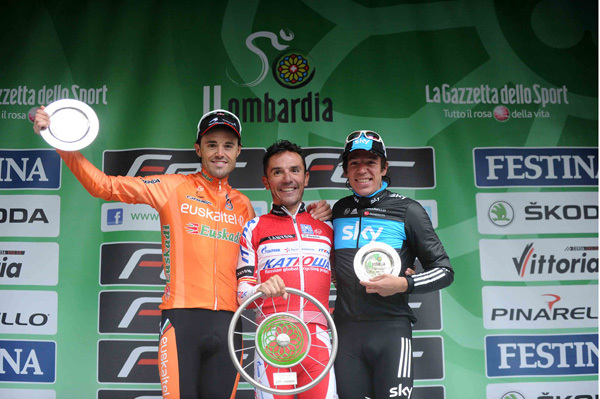 Second classified at 9 seconds was the Euskaltel - Euskadi rider Samuel Sanchez (from Spain), whilst third was the Sky ProCycling Colombian rider Rigoberto Uran. Rodriguez' comments at the post-race press conference. "I was extremely happy, this is the kind of race you dream about winning all your career. I crossed the line with the bottle in my hand because I always do it, this is a superstition gesture that I really like". "I don't know if I've been the strongest rider this season, I'm definitely the one who scored more points but many others have been strong so far too". "I saw Alberto (Contador) in a great condition at the Worlds and at the Milan-Turin but maybe after a day like today he was a little bit tired. The more strong riders there are in a race the happier I am that I am winning. The victory in Il Lombardia for me it's a glorious achievement. I don't like rainy days because racing is more dangerous, even if I'm pretty good when it rains". "I don't know what will be my racing calendar in 2013, I'm very happy with my 2012 season but I'm waiting to see what the courses will be, starting from tomorrow at the Giro d'Italia presentation." "I think this season I've raced most of the races as leader of my team, but when I'm not at the top I'm very happy to help my teammates if they feel better than me. I believe this is pretty normal when you are member of a team." 12 Franco Pellizotti (Ita) Androni Giocattoli, all s.t.